Watching the Tube - includes getting your PC ready for YouTube viewing, finding video, signing up for an account, and creating favorites. Loading Video to YouTube—covers the nuts and bolts of shooting video, transferring it to a PC, editing it, and sending it up to YouTube. 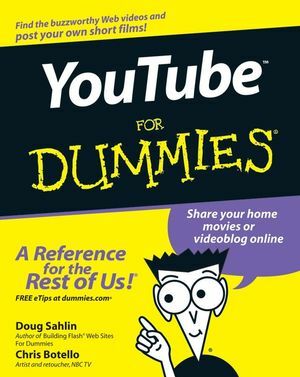 Bringing Along YouTube—covers the various ways you can use YouTube video in places other than on the site. Includes mobile YouTube and adding videos to your MySpace page or another Web site. I Always Wanted To Direct—explores how to use YouTube's directors program to upload longer video, use the site for marketing, or launch your own videoblog. Doug Sahlin is an author, photographer, and videographer living in Lakeland, Florida. He is also the president of Superb Images, Inc., which is a wedding and event photography and videography company. He has written or co-authored 20 books on graphic, Web design, and video-editing and imageediting applications, including 50 Fast Digital Video Techniques and Photoshop CS2 for Digital Photographers Only. While working on his books, Doug has produced commercial photographs and video of actors, authors, architecture, automobile races, fashion models, food, landscapes, and products for his clients. His work has taken him from coast to coast and north to south, and has been seen in print and on the Web. Chris Botello is a Photoshop artist and graphic designer living in Los Angeles, where he works as a retoucher and finisher on movie posters and marketing campaigns for the motion-picture industry. Chris began his career in the graphic arts as print production manager for Premiere magazine. He designed movie posters for Miramax Films and was the art director for Microsoft’s launch of sidewalk.com/boston. Chris is the author of a successful series of books on Adobe Photoshop, Illustrator, and InDesign for Thomson Course Technology. When not working, Chris loves to travel and gets the opportunity to do so as a guest instructor for Crystal Cruise Lines.